Working with Professor Traci Mann on her new website was a really fun experience. Traci is a Professor of Psychology at the University of Minnesota and has spent years and years doing fun research (with M&Ms and marshmallows!) on diets, weight loss, and the role food has in our lives. Her new book is a compilation of that research and as fun to read as her studies are to take part in. While Traci knew she needed a good website for her new book (her publisher and marketer told her so!) she didn’t know where to begin or what to do. So I started by answering all of her questions and walking with her through my project brief. Then we walked through my steps to creating a new website and pretty soon we had her new site all ready to eat go! 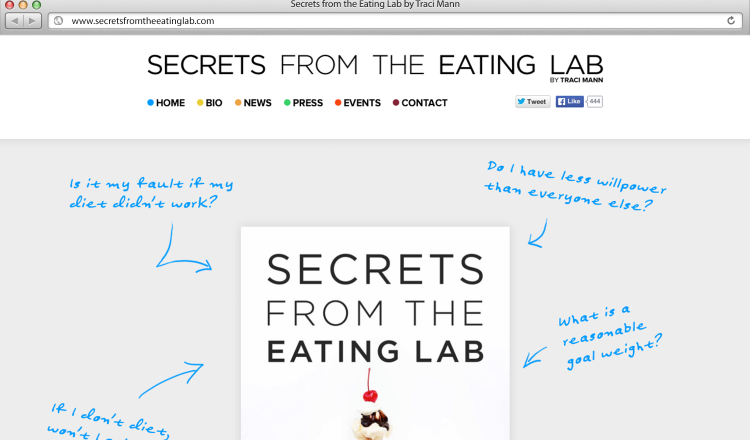 The new book is all about debunking a lot of myths in the weight-loss world, so we decided to make the homepage a great intro to the questions you’ll find answered in the book. Hover states on all of the questions/answers provide an immediate level of interaction for the viewer while also telling them what the book is about. From there we played on the candy theme in the book cover and themed each page to use its own bright color. The site also features custom features so that Traci can easily add upcoming events, blog posts, and book reviews by herself. As Dr. Mann’s book explodes onto the wellness scene and her work garners more and more attention she has a website built to give readers an easy way to get ancillary information and buy the book! Brad is an incredible designer. My book’s website is exactly what I wanted, even though I couldn’t even begin to articulate what I wanted before talking to Brad. But somehow he was able to elicit preferences and opinions from me with his project brief process, and he came up with three distinct design concepts for me to consider. (Other designers I interviewed would only create one.) Plus, he didn’t run for the hills when I ultimately gave him a near impossible request: I asked him to create a website that would come across as trustworthy, scientific, warm, approachable, beautiful, and quirky. Those are not things that usually go together. But he found a way. (Three ways, actually!) Not only is the website all of those things and more, but he finished it faster than he promised, and he was great to work with. I am so glad I hired Brad for this project. I am absolutely delighted with the results. Brad is a pleasure to work with: professional and friendly every time. He continuously produces excellent work. I still get compliments every other week on my site design and I think a huge reason my conversions are through the roof is because of the stellar work you did on that site. That project was by far the smoothest experience I’ve ever had with a contractor and I wouldn’t hesitate an instant to work with Brad again. I have not known of anyone that has worked with him on a project that has not been 100% pleased with the end product but also with the process. …finding Brad was the answer. He listened, researched, welcomed honest responses to drafts, adapted, educated us, stayed on deadline and delivered a first-rate creative website that continues to draw rave reviews. It was so much fun working with Apt Design on our logos and branding. Brad listened carefully to what everyone had to say and then somehow gleaned the critical points out of that diverse input. The quality of his work and his professionalism (think pragmatic time management, setting expectations) are superb. He’s a seasoned freelancer and that means good things if you’re a client of a collaborator. Brad was excellent to work with! He was creative, utilized broad input and was very quick to turn around deliverables. I would highly recommend Brad and Apt Design.